The Month Of The Holy Rosary? The month of the Holy Rosary is October and this entire month is dedicated to the Rosary. The feast day of the Holy Rosary in particular is October 7th. The feast of the Rosary is held on October 7th in memory of the glorious and triumphant victory at the battle of Lepanto. That battle was the most convincing military victory that proved without a doubt the great power of the Rosary. The month of October is a good time to commit to praying the Rosary everyday. The Rosary will bring great peace and holiness to your life. It is a powerful instrument for conversion. The Rosary is the best method of honoring Mary. It protects the Church from false teachings and keeps her safe from the attacks from the Enemy. Pray the Rosary everyday this month. Pray it especially for priests. Even though the Year For Priests has come and gone, they still need your constant prayers. Make rosaries, have them blessed and give them away - children love this. You can teach a group of children to make rosaries of their own. They will really be excited about praying with a rosary they made themselves. You can give the rosaries you make to the elderly in nursing homes, take them to Catholic schools or Religious Education classes at your parish, or mail them to prisons. Make sure you have them blessed by a priest first. Print up some of our Rosary booklets and hand them out to people whether it be your CCD class, neighbors and friends. Children really like these as well! 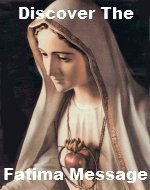 Invite a Pilgrim Virgin statue into your home and pray the Rosary everyday while it is there - Find out if there is a Legion of Mary group nearby who takes around a Pilgrim Virgin of Fatima statue. It is a beautiful way to spend October. Different groups have different customs but usually a large statue of Our Lady of Fatima is taken from home to home especially during the month of October to promote the recitation of the Rosary in families. The statue usually stays with each family for one week. Attend Mass on October 7th, the feast of Our Lady of the Holy Rosary and on October 13th, the day of the final visit of Mary to Fatima. Use our Personal Rosary tracker to help you get into the habit of praying the Rosary everyday. Note: this tracker was made for praying the rosary for priests during the Year for Priests. It is in the process of being revamped, but is still good to use for keeping track of your rosaries. It wouldn't hurt to also use it for priests. If you have a blog or a website of your own, link to us! Tell your friends about this site and become a fan on Facebook or spread the word on Stumbleupon and other social networks you are apart of. This way you will be promoting the Rosary during this month of the Holy Rosary. October is the perfect month to get started with the daily Rosary devotion. 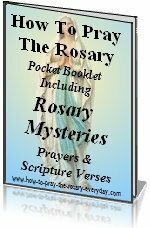 Our website has all the tools to make is a pleasant experience from meditations, to videos, to even a free Rosary mp3 download. And for those of you who already in this beautiful habit, it is the perfect month for you to share this devotion with others. Return from Month of the Holy Rosary page to our Home page.